Cost – A 3-hour session costs £30 per person. This covers Sylvia’s teaching time, ingredients, recipes to take home in a clip file and the option to sit down and eat what you’ve made afterwards. The courses are residential which means you must stay at least one night B&B at the normal room rate per person. If you’re staying with a partner who’s not doing the course they may join you to eat afterwards. B&B prices are £35, £40 or £45 a night per person depending on which room you choose. 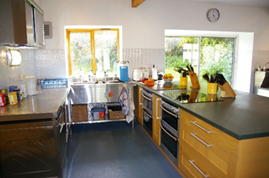 Children are welcome to join the course with adult supervision – B&B is £10 a night and a 3-hour cookery session is £30. Dates – Sessions are run on an individual basis as and when requested and are suitable for 1-4 people. Choose 1 or 2 consecutive nights of your own choice but not Bank Holiday weekends. Check the availability chart on our website to find 1 or 2 nights when we don’t already have B&B guests, then send us an e-mail or give us a ring to confirm that the dates are OK.
Times – You can choose either morning, afternoon or evening sessions. There may be other B&B guests staying so times are designed to fit around our commitment to turnaround of B&B rooms, washing, shopping, cooking for and welcoming other guests. A stay of several nights will allow you to choose how many sessions you have and incorporate a break to relax in your room or the garden, walk along the river, go shopping in Kendal or visit the Lakes. Booking & Payment – We don’t take a deposit, you just pay by cash or cheque (payable to ‘S Wilkinson’) when you leave or by bank transfer (we can supply details). We can also provide Gift Vouchers (please ask). · using our tried and tested recipes for reliable everyday meals. Our kitchen – Our busy working kitchen is also our vegan family kitchen and has been the heart of our home for the last 9 years since we moved from Fox Hall. We cook on electric using 2 Neff double ovens and 2 ceramic hobs. The worktop was specially sourced from Burlington slate quarry and it took 4 workmen with steel toecaps to lift the 2 pieces into place. The garden at Prizet Stables – We’ve been working hard over the last 9 years to make the large garden more productive. This is not an easy task with a large family of wild rabbits occupying every corner of the garden so we’re concentrating on growing what they don’t eat or can’t reach – broad beans, soft fruit, salad crops. The garden is full of wildlife and is being managed veganically. We use ash from our biomass heating system to enrich the soil and kitchen waste is composted. Hygiene - Just a reminder that good standards of hygiene will be required in the kitchen. Please wash hands before handling food, remove jewellery and tie back long hair. Wear sensible shoes and keep cuts covered, etc. Clean aprons will be provided. You may keep your mobile phone handy and switched on if you need to.